Breaking News! 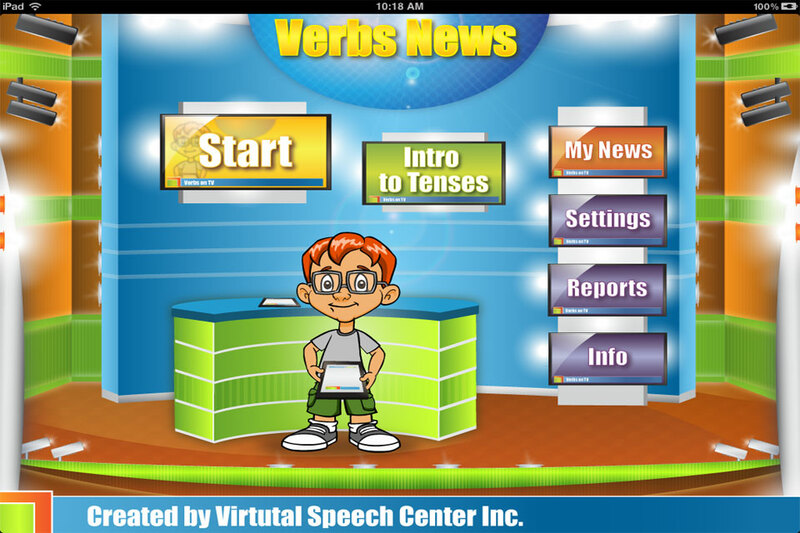 This just in...a new application is that focuses on verb tenses is now available for the iPad! With a news theme and graphics as well as the ability to collect data, this application is revolutionary in the iTunes store! 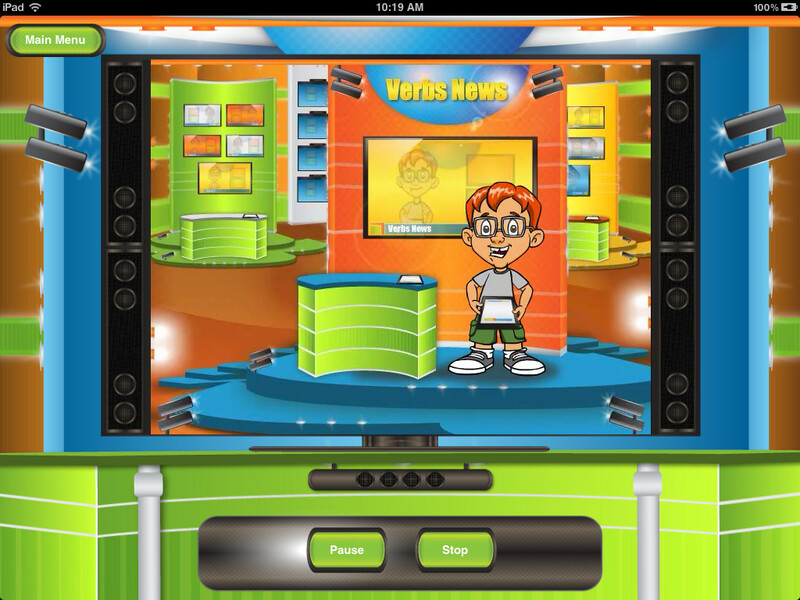 The application is called Verbs News, developed by Virtual Speech Center. To read my review of this great application, continue reading below. The entire application's theme is a news room. The students are the reporters and Andrew is the news anchor who introduces you to the application. All icons and backgrounds are related to the news theme, which is motivating to students! Press the "Start" button to begin application play with a student. Application play will be discussed later in the review. When pressed, Andrew will state "tap a news channel to start having fun!" The four choices of "channels" are simple present, past, simple future, and present continuous. Once you choose a "channel", a lesson of the grammatical concept chosen will play. First, the child narrator will read the text at the top of the screen. On the first page, the concept is described. Pressing the number buttons at the bottom will play move on to the next part of the lesson. The second part shows a sentence example using the tense chosen. Finally, the third screen will discuss any prefixes, suffixes, or irregularities in changing the verb tense for each singular or plural noun or pronoun. If you do not press any buttons, the application will play through each part on its own. Also within each lesson, a Past, Now, and Future timeline will appear at the bottom of the screen. It showcases Andrew walking in the present, past, future, or continuously. This helps the student visualize when a tense occurs in time. This part of the application allows students to record themselves on the screen. Switch between the front and back camera by pressing "Switch Camera". Start recording a segment by pressing "Start Recording News". Then, press "Stop" when you are done recording. You can then play the recording by pressing "Play". During the playback of the video, the "Pause" and "Stop" buttons are available to use. The child narrator will introduce the news and close it after the video. If you wish to replay the previous vide, press "Replay"; otherwise, press "Start" to record a new video. Videos will not be saved to comply with HIPAA regulations. "My News" is also used as a reward if you choose that option in the settings menu. This will show reports of data compiled for each student who has used the application. Names appear on the left hand side of the page. Highlight the person's name to show completed sessions from that person. Then, press the activity or the date and time button to sort sessions. After that, highlight the session you wish to view. If you choose to look by activity, it will compile all of the data together between sessions for the activity. You can then sort within the activity by tense type. If you choose the "Date and Time" option, it will show a report for the specific session with the activity, each word within a category, and whether it was scored as correct or incorrect. It will also show the accuracy as a percentage. E-mail a report to yourself by pressing the "E-mail Report" button within the session report. You must have your e-mail installed on the Mail application on the iPad for it to work. It will place a table in the content of the e-mail. To delete a user from the Reports page, press the green button next to the "Select User" text. Red minus buttons will appear next to a user. Press the button next to the user you wish to delete and a "Delete" button will appear. Press that button next to the user to delete his or her profile. Virtual Speech Center's, the developers, logo is at the top of the screen. There are also buttons on the side in which you can press to visit their website, newsletter, Twitter (@vspeechcenter), or Facebook page. Pressing the "Start" button on the main page will begin the application play. Choose a student from the list or add a new student to use the application with. Press the "Add Student" button and then press the box below the text shown as "Student's Name" to type in the student's name on the keyboard. Then, press "Save" to add the student to the student list. If you do not see the student you want to use the app with on the student list, make sure to scroll through the list of names by swiping up or down on the list itself. To select a user to play, press the person's name and a check mark will appear. You can select multiple users to play. Press the "Next" button to begin play. Once you choose the student(s) to play on the application, choose the activity to play. You can choose between "Auditory Bombardment", "Fill-In", or "Make Up Sentences". 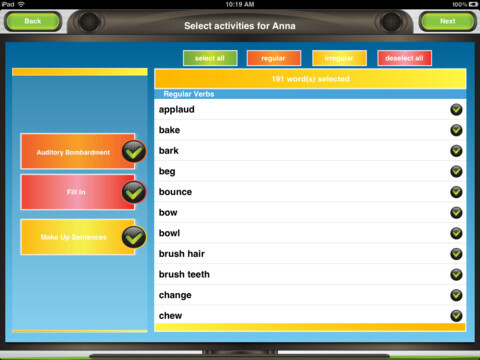 Then, select which type of verbs to play (regular, irregular, both, or choose individual words). To select individual words from the list, press the text by each verb. The selected verbs will show check marks next to them. Swipe up and down the list to see all of the verbs. Press "Next" once you have chosen the task(s) for a student. If you have more than one student, the next student will appear and you will have to make choices for that student. Pressing "Next" once you have completed choosing activities for each student will move on to the next task. You must choose a tense to focus on. 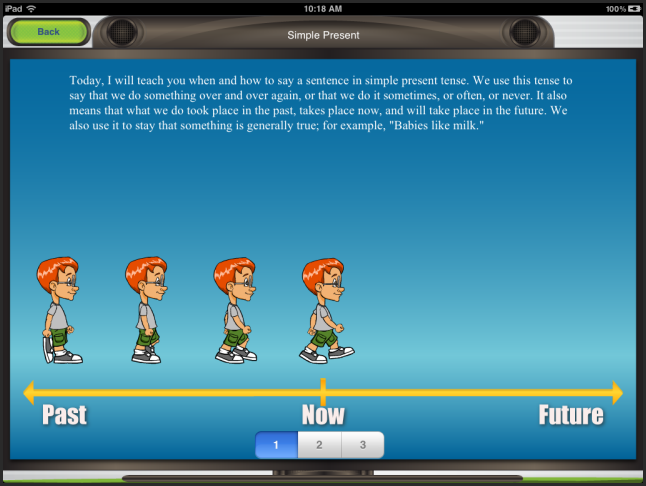 You can choose between simple present, past, simple future, and present continuous. You can change between tenses during the game on the left hand side of the app by pressing one of the buttons. Once one of these tenses is chosen, application play will begin. Auditory Bombardment - shows images of people performing various actions with text for the word at the top as well as a sentence below. The sentence including the verb will be read aloud by a narrator. Make sure you have the audio turned on in the settings for this! Press the arrow button to go to the next image and the repeat circle arrow to re-play the sentence aloud. Fill-In - shows images of people performing various actions with text for the verb in present tense at the top and a sentence below that. The sentence is missing the correct verb. The sentence is read aloud as well as the verb choices on the buttons to fill in the blanks. You can replay the sentence by pressing the replay arrow. Pressing the correct answer plays a sound and shows an Andrew icon at the bottom of the screen. If the incorrect answer is chosen, a different sound will play and the correct answer will be shown if you have that option turned on in the menu. After choosing an answer, the accuracy percentage at the bottom right of the screen will change and the next image/sentence will appear. If you chose to have rewards, after the number of correct answers chosen in the settings, the child will be able to record themselves on the news part of the app. Make Up Sentences - shows images of people performing various actions and text for the verb in present tense at the top. There is a sentence below that which states "tell me what this person ____" (depending on the tense you chose; "is doing right now", "will do tomorrow or in the future", "did yesterday or in the past", "does or what you do") to prompt the child to state a sentence about the picture using the correct verb tense. The student's speech can be recorded at the top of the image by pressing the red circle record button. Press it again to stop recording and the green arrow play button to play the recording back. This is optional and recordings do not save. Press the green "check mark" button if the response was correct or the red "x" button if it was incorrect.If the incorrect answer is chosen, a different sound will play and the correct answer will be shown if you have that option turned on in the menu. After choosing an answer, the accuracy percentage at the bottom right of the screen will change and the next image/sentence will appear. If you chose to have rewards, after the number of correct answers chosen in the settings, the child will be able to have the choice to record themselves on the "My News" part of the app and once that is completed, press the "Continue" button to head back to application play. Press the "Finish" button on the top left hand side of the page to complete a session. The "Session Report" page will appear. This will show the date, client name, activity, accuracy, tense, regular/irregular verb type, and specific words and whether they were answered correctly or incorrectly. You can e-mail the report from the "Session Report" page by pressing the "E-mail Report" button. Otherwise, press the "Main Menu" button to return to the main page. This session information will be saved in the "Reports" section for future access. I am so happy that there is finally a verb tense application on the market that not only teaches children about tenses with visuals but can be used in therapy! I feel like I had been waiting for this one forever! The fact that this application has a theme is wonderful. The News theme not only fun but the fact that each button is a TV screen and the application is not cluttered is perfect to keep students both motivated and concentrated on the content. Plus, I know students love seeing themselves on the iPad screen, so the "My News" is definitely a must-use! The ability to keep data is wonderful. Taking data and working with students at the same time can sometimes be difficult, but being able to track it for multiple students at the same time and then e-mail it is great! Plus, being able to show parents their students' progress at an IEP meeting is always helpful! Being able to choose from a hierarchy of language activities (Auditory Bombardment, Fill-In, and Make Up Sentences) is great because I can use the application with my students at different levels of mastery. Also, being able to choose irregular vs. regular verbs, between tenses, and settings (showing text/answer/playing audio) definitely makes the application customizable to my students' needs. I would like to see a different, shorter reward associated with activities or a time-limit on the "My News" so that my students do not try to keep recording themselves over and over when we need to get back to playing the application. I like having it for creative and fun reasons, but I'm worried that I may not be able to always redirect students back to application play. Maybe students could read from a script on a teleprompter that includes the type of verb they are working on or see a news animation. The fact that images and verb order are consistent each time the application is played may become tiring to my students or routine where they are memorizing specific words rather than concepts. I would like there to be a shuffle function if possible! This was noted in another review of this application on a different website, but I noticed that some of the images seem a bit distorted/stretched on the screen. I would like to see that fixed so that my students with vision impairments or who would focus on that aspect and not learning would not get distracted and be able to view the images better. For the Audio Bombardment portion of the application, it would be nice to allow students to hear the word by itself in its correct tense by pressing on the word and keep the sentence separate by having to press on the sentence itself to hear it. Articulation/Voice/Fluency - Have students read from a script or use spontaneous speech to record themselves on the "My News" portion of the application on the main page. Then, the students can play back their report and self-assess their speech. Another way to use the app is to have students read the fill-in sentences or make up sentences to go with the images using their best speech. 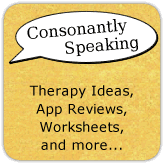 Finally, if you choose words on the app from the list that relate to a students' articulation sounds, only those will appear and you can have them used for Auditory Bombardment, at the word level, and in elicited/spontaneous sentences. Writing/Expressive Language - Have a student write a news report and deliver it in front of the "My News" camera. Encourage students to use appropriate tense for their report. For example, if the student wants to talk about an upcoming carnival, make sure that the report is in future tense. If the student wants to talk about a rain storm that is occuring at that moment, have the student write in present tense. If the student wants to talk about his or her vacation from last year, have the student write in past tense. Another way to use this application is to take the verb from an image and write a sentence about it. Tenses/Verbs - Obviously, this application was made specifically to focus on verb tenses. Make sure that you are working with the student at his or her level and area of need. Story Telling - Have students make up a story about the picture shown (written or verbal). 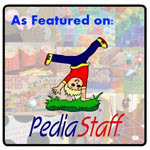 Receptive Language - Children can name and describe different objects in the pictures. Emotions - Some of the action verbs shown in the application involve different emotions (such as losing in soccer, scraping your knee, receiving flowers, catching a fish, etc.). Discuss how the different people in the images may feel. Verbs News is available for the iPad for $14.99. It is currently on sale for $9.99! Consonantly Speaking was given an application code to review this application by Virtual Speech Center. Consonantly Speaking also received an application code to give away for the last week in August for their giveaway event.